These are the adjectives that ought to describe the pastor, according to Eugene Peterson. Though written in 1989, The Contemplative Pastor is just as, if not more, relevant to today’s church culture. The pastors we honor in American evangelicalism often do little or no pastoral work. They are high-achievers, brands unto themselves. They are CEOs of ever-expanding religious empires. They are busy. They tackle problems head-on. They have neither the time nor the patience to plow the fields of the hearts of their congregation. 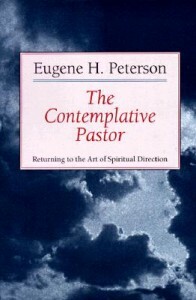 The Contemplative Pastor is must-reading for all who are pursuing the ministry. My fear is that many young pastors, especially church planters, are motivated not by the needs of the kingdom but by the needs of their own egos. Peterson is a douse of cold water to a drunken narcissist. The work of the pastor is gloriously ordinary, but we have stars in our eyes. We long for crowds and lights and buzz, but the pastor receives something far better – ordinary people who struggle to believe, to be faithful, and to attend church even twice a month. This is not the job for superstars, but it is perfectly suited for the unbusy, apocalyptic subversive. What does God look like in slow motion? Does the thunderbolt in his hand meet halfway between the earth and sky, like real lightning? Does the furrow of his angry brow seem extra intimidating in super slo-mo? 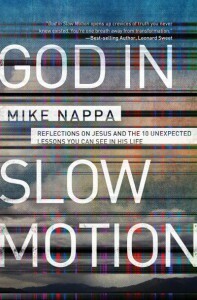 In fact, God in slow motion is Jesus in real life, and according to author Mike Nappa, there are ten “unexpected lessons” we can learn from his life. These ten unexpected lessons take the form of apparent contradictions – oxymoronic chapter titles that capture the inverted nature of what we think God looks like and how he actually appears. Mischievous Glory is how Nappa describes the birth of Jesus, which is the first, and perhaps most profound, chapter of the book. Nappa argues that the way in which God chose to enter the world upends all of our expectations of what glory truly is. We see, in the nature of the Incarnation, that Glory = Humility. Taking ten stories from Jesus’s life and ministry, Nappa paints a picture of God that is both surprising and comforting. God is, after all, like Jesus, and not like the angry gods of our imaginations. To see God in Jesus is to see God in slow motion, viewing each frame of God’s activity with full clarity and in sharp focus. Jesus makes God clear, though that doesn’t mean the oxymoronic lessons make any more sense to our imperfect, rightside-up (or is that upside-down?) minds. 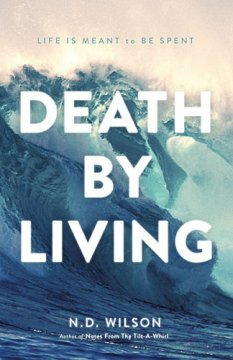 Nappa’s book reads like a series of sermons about Jesus, and would be useful for new or younger believers that are just getting to know what God is like. It could also be a tremendous help for those who have grown up with a false understanding of God, particularly one that painted a picture of God as a loveless, joyless, graceless deity ready to dole out punishment at the first opportunity. 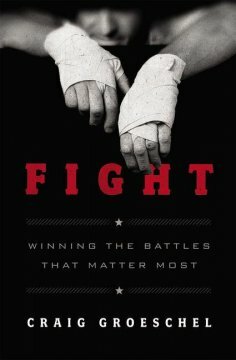 In his forthcoming book, Fight, Craig Groeschel turns his insight and humor toward the issues that American men deal with every day. Using the famous biblical strongman Samson as a counterexample, Craig calls out the three primary sins that plague men today: pride, lust, and entitlement. Each of these, he argues, cuts men off both from fulfilling their intended purpose and from their most important relationship, which is with God, their true Father. The book is arranged in an easy-to-read format, with each section divided up into subsections (or subchapters) that typically run just 3 or 4 pages. A guy could easily read a subchapter between meetings, in a waiting room, or before work each day. The accessibility of the format, as well as the content, makes this book a prime candidate for small group studies. While the material of the book doesn’t go as deep as, say, John Eldridge’s classic Wild at Heart or LeAnn Payne’s Crisis in Masculinity, it may be more likely to reach men on the fringes of our churches–those who come because their wives demand it, and who are too distracted by the allures of this world to invest any of their time or energy into a relationship with Jesus. The book is at its best when Craig combines his self-depracting humor with broadly-appealing biblical insight. He is casting a wide net, one that will capture the attention of most middle-class American men. In that lies the book’s value: to get men thinking about the deeper issues of life who may not otherwise stop and think about such things, much less develop a plan for fighting the various temptations in their lives. If I were overseeing a men’s ministry and looking for a way to start discipling those men who are on the fringe of my church, I would definitely use this book. It’s funny. It’s challenging. It’s helpful. And it goes deep enough to get men invested in developing a plan to fight the most important battles in their life, but not too deep to overwhelm them. After taking men through Fight, I would probably turn to a book like Wild at Heart to help men confront the inner realities of sin and temptation, as well as deepen their relationship with Jesus. All in all, this was a really good book with a lot of ministry potential. I recommend it, especially for use in men’s groups. BookSneeze® provided me with a complimentary, advanced reading copy of this book.